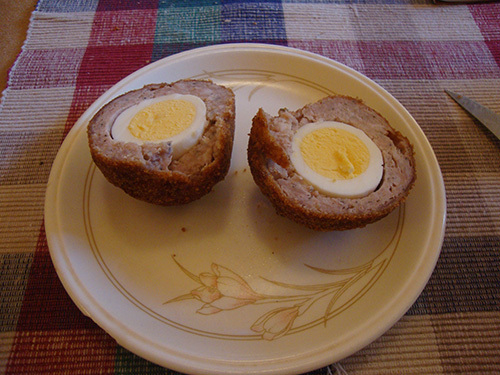 Did you know that the humble scotch egg was invented in 1738 at Piccadilly swanky grocers, Fortnum and Mason? That’s the claim, anyway, and nobody as far as I’m aware has successfully refuted it. So yesterday I popped in, as you do, went down to the Lower Ground where they sell meats and treats. “How much are the scotch eggs?” I enquire, resisting the the temptation naffly to add “my good man”. Well, it is Fortnum’s. I ordered a brace. So are they four times as good as ones you get in the supermarket? Or even your local butcher? I am happy to report that, most definitely, they are. Note how thick the sausage meat is and how it goes all the way to the egg. And the meat itself is lovely, a bit like cumberland sausage, I guess. So in this case, you do get what you pay for. You may disagree, but in my view the best relish to have with scotch egg is good old British brown sauce. 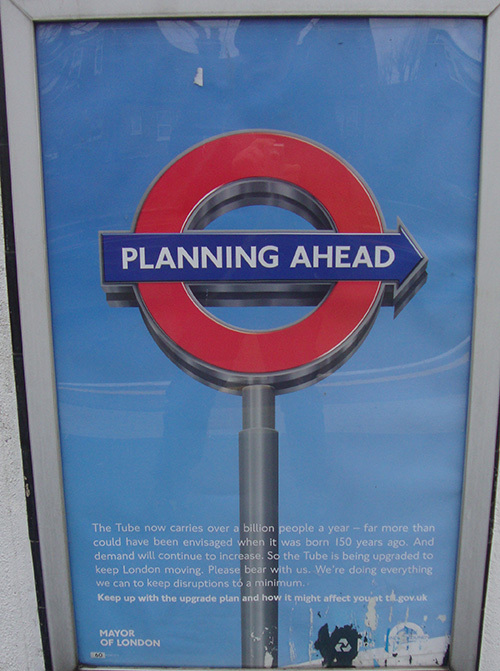 No, you’re not going to meet Henry VIII. Or Anne Boleyn. Not even Thomas Cromwell, or Thomas Wyatt who provided the title.. But you might get to talk to someone who saw The Lady once, and someone else who is hoping to supply her with silk, and someone else again who knows her initial is being painted onto the Royal barge. Most certainly you’ll meet someone who wants your money – for the king’s latest gift, you understand. And you’ll need to have a good story ready for what you’re going to say when you’re asked to take the Oath of Supremacy. 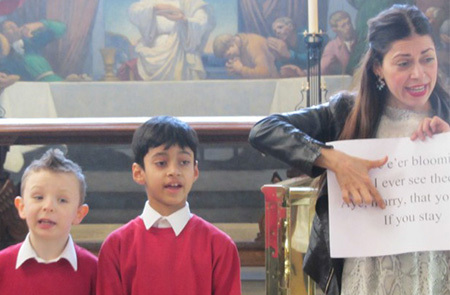 And that’s how we teach history to London nine-year-olds. 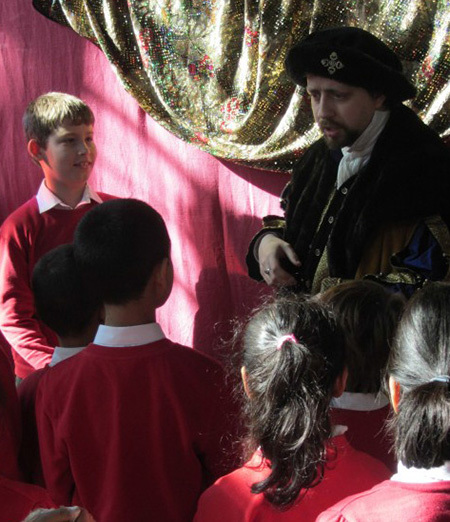 We spent most of March in 1533 or somewhere near it – us and nearly 500 Tower Hamlets and Hackney children. 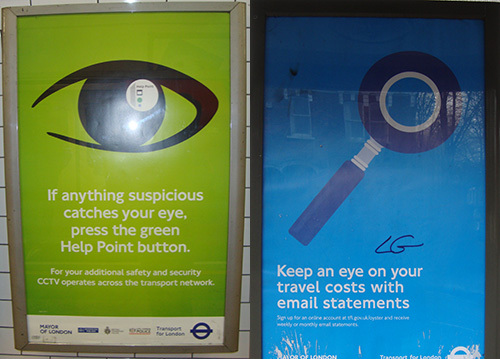 It’s a project that’s become a habit – 16,000 participants so far, and still counting. The children come into the past time with us, encountering people and dilemmas of a time when news travels by decree and rumour, nine-year-olds are quite old enough both to work for a living and to be hanged, and hunger is routine. It is of course a time when political and religious change is happening at dizzying speed. The plays are specially researched, and are part scripted, part devised so the action is slightly different every day. Everything that happens either did happen, or could have happened at the church of All Hallows by the Tower in the Lent of 1533, when London was rife with rumours of the king’s marriage to Anne Boleyn but it might be dangerous to mention it, and fatal to criticise it. Characters include a barmaid who has become dangerously involved in the New Learning, her childhood friend who has become one of the Lord Mayor’s enforcers and a court lady with a terrible decision to make. 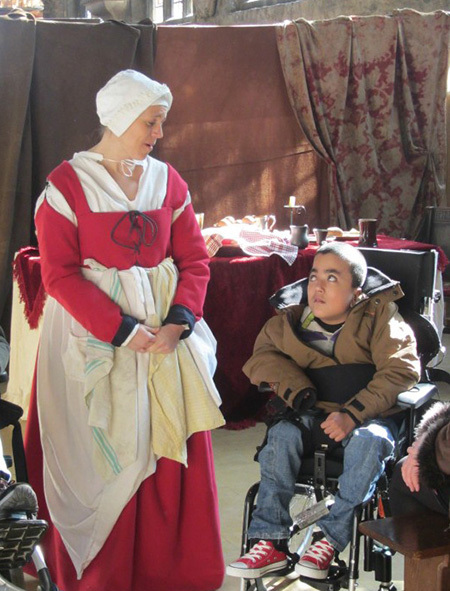 The children become Londoners of different degrees – some from families about to be asked to contribute to the king’s latest “present”, others already part of the working world. During the action groups of participants are part of a sequence of scenes taking place in different parts of the church. All Hallows, like other churches at the time, functioned as a shopping centre, meeting place and informal law court as well as a house of prayer. During our initial research for the project we discovered both that the church wardens owned an extensive property portfolio at this time, including a pub called the Dolphin, and that they, like many others, made money by hiring out areas of the church to local shopkeepers. So the south aisle gains a snack-bar, a silk merchant looking for a suitable place to trade and one of the many recorded altars to individual saints reappears. 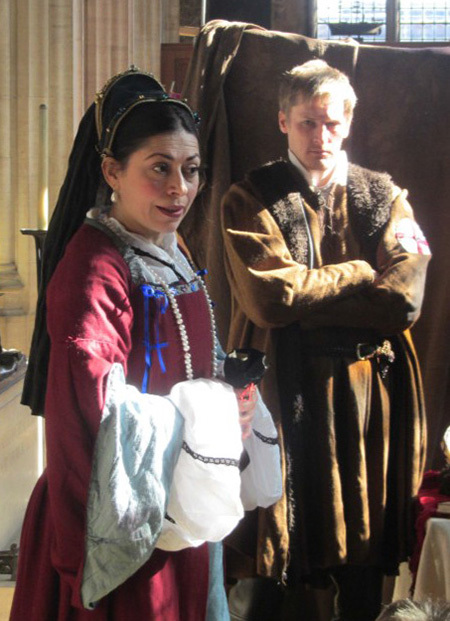 The day finishes with taster sessions of Tudor music and dance, and the opportunity to write (with a quill pen) to Henry VIII to try to persuade him to be forbearing to Londoners. Children are routinely angered, usually excited, occasionally bemused, but rarely left indifferent to the concerns of 500 years ago. Often they learn a great many historical facts, but by a process akin to osmosis. 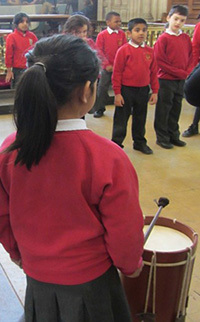 One teacher commented recently that “it was wonderful to see the children working so hard without realising they were doing so”. We have used up our second batch of Members’ cards (a very good sign) and I must design and order new ones. Fast. As we continue to grow, new members and renewals no longer mosey through the door in dribs and drabs. So I must urgently choose a lovely picture to feature on our next round of Members’ cards. The difficulty is that there is so much choice. 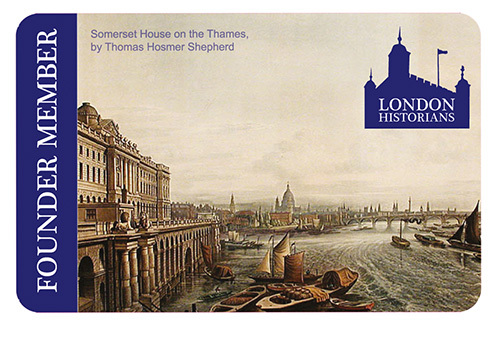 Our first card featured Somerset House and the Thames looking downriver. By Thomas Hosmer Shepherd, 1817. 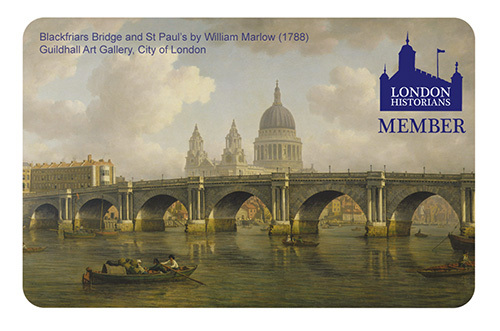 Our current card, a gorgeous painting by William Marlow of St Paul’s and the new Blackfriars Bridge in 1788. 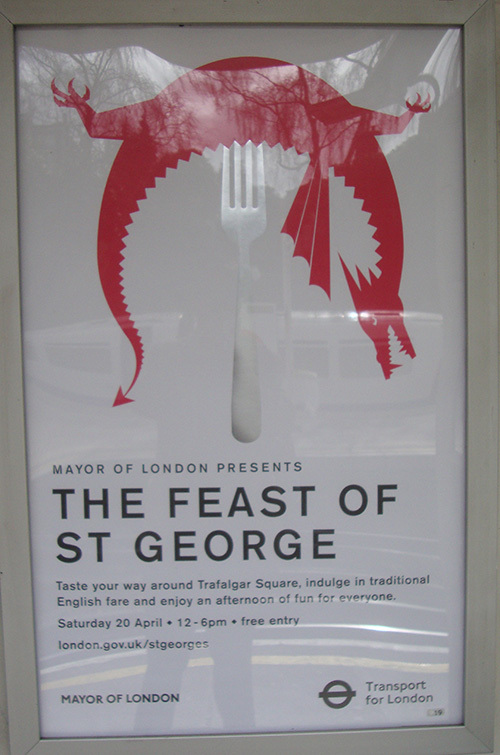 You can see the original in the Guildhall Art Gallery. As you can see we need a nice big piece of sky or otherwise featureless section in one of the corners in order to place the LH logo. 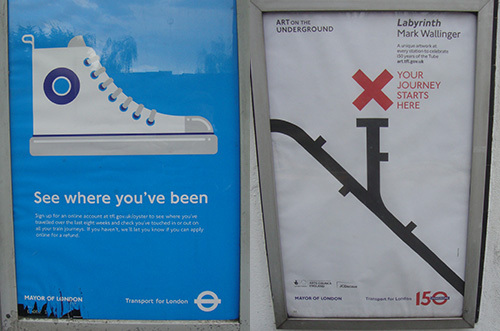 The only other criteria are that it needs to be obviously London, and historical. It should be a painting, etching etc., not photograph. Finally, it should be royalty-free or royalty-cheap. 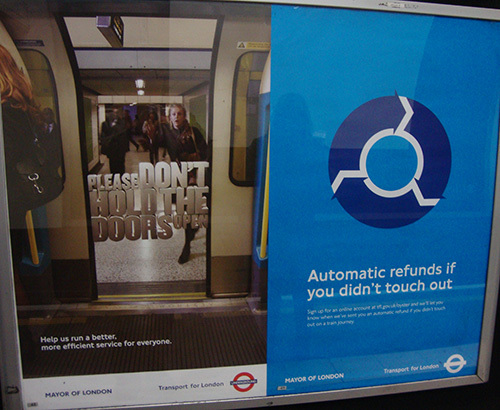 We don’t mind paying a bit for the right image. Email your suggestions to us or just write in the comments. 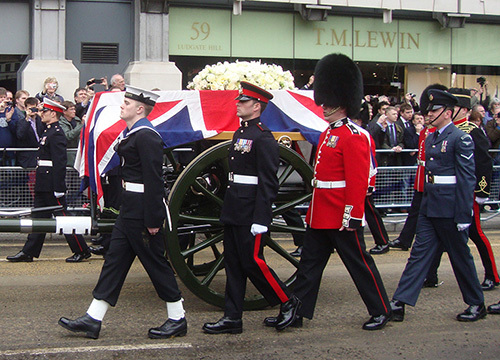 Regardless of your views on Margaret Thatcher, her funeral service at St Paul’s today – and the procession which preceded it – was a historical event involving a long-standing prime minister and London MP. I went, got myself a good spot, and took these pictures. You can see the full set on Flickr here. I made friends and a deal with a fellow in the crowd: him film clips; me photos. His clips are on Flickr here. Arrived on the early side. Just police and people going to work. And me. 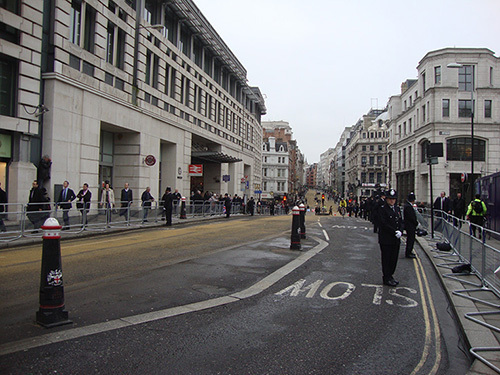 Looking down Ludgate Hill to Fleet Street. 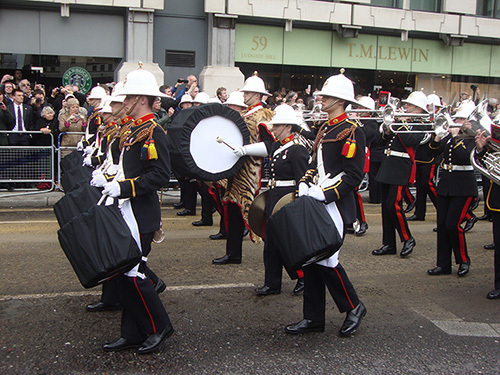 Royal Marines band. Maggie admirers from Israel in attendance. 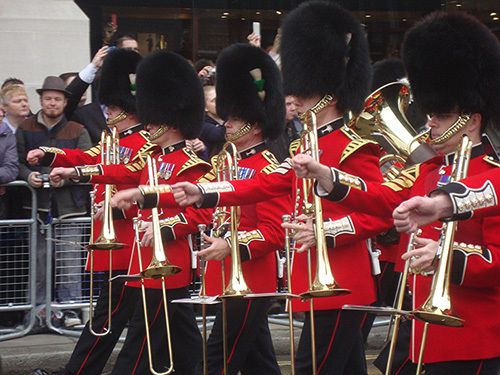 Bandsmen of the Welsh Guards. 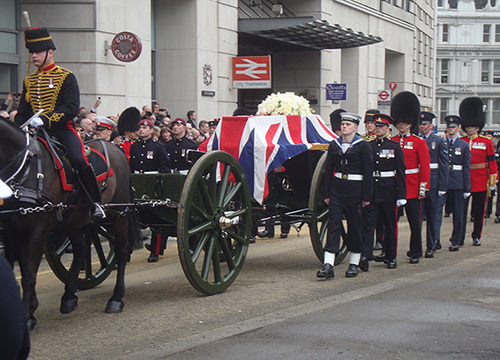 Gun carriage of King’s Troop, Royal Horse Artillery, bearing the remains of the late PM. Much comment has been made of the magnitude and expense of this funeral on the grounds that it is unprecedented. 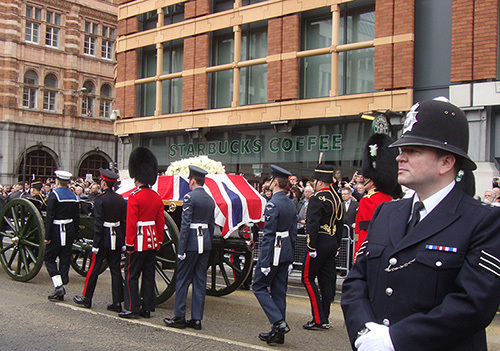 You’ll be interested in this excellent article which tells us about prime ministers who have also had not-so-cheap public funerals: there were quite a few. 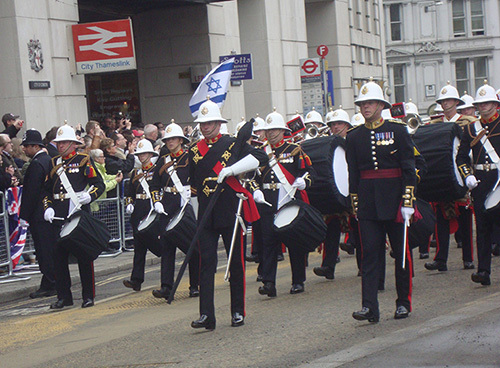 My impression of today’s proceedings that they were actually quite low key compared with my expectations; popular with the crowd; and our military on parade were spot-on as they always are. Smallpox and the forgotten 18th Century Medical Revolution. This book tells the story of inoculation in the West from the 1720s, 70 years before Jenner published his findings on cowpox vaccine. Before the 18th Century, smallpox was a blight in Western Europe and the American Colonies, particularly among the very young. Frequent epidemics scythed through populations where even survivors were left horrendously scarred and in some cases blinded. It was understood that if you survived the disease, you were thereafter immune, but that was the extent of our knowledge. Yet in parts of Africa and the Near East, people understood and practised inoculation. This book tells the pre-Jenner story of the pioneers of inoculation against smallpox, in Boston and in England; how early practitioners took the first tentative steps to inoculate local patients in the face of stiff opposition from jealous professional rivals, nervous civic leaders and religious fundamentalists (hence “Defying Providence”). Unlike cowpox inoculation from Jenner’s time onwards, early smallpox inoculation introduced pus from existing smallpox sores and was widely practised if not fully understood, in the Near East and Africa. Western tradesmen and diplomats, along with North American slave owners, learned of it from the denizens of those regions. So we have the story of Lady Mary Montague, late of Turkey, having her children inoculated. Meanwhile in Boston, Zabadiel Boylston (one imagines probably an ancestor of the author), hearing of tales from the East and the stories of local slaves, inoculated his own children and proceeded on the lonely battle to spread the practice among Bostonians. Back in England, experimental inoculation had powerful and influentual patrons in Sir Hans Sloane and the Prince and Princess of Wales. We have the remarkable story of the “Newgate guinea pigs” – felons in the notorious prison, men and women. who were offered pardons in exchange for being inoculated with smallpox pus – potentially a death sentence in itself. The experiment was a success. The narrative takes us through the next 60 years, a story both of progress and setbacks, trial and error, slow but sure improvements; the growth of inoculation hospitals and clinics; how practitioners of inoculation became wealthy, in particular Robert and Daniel Sutton, father and son from Norfolk. They developed the “Suttonian Method” which was distributed via medical apostles using a franchise method. And finally, of course, we have Jenner, whom the author treats as another player, albeit a significant one, on the long march to the eradication the terrible disease of smallpox. He explains too how it was Jenner’s first biographer who applied the distorting lens to the picture, giving us milkmaids and all the rest of it. Defying Providence is a fascinating read and Dr Boylston does a great service in providing the whole, brilliant story of the rise and triumph of inoculation from the real beginning and not just the denoument, which to most laymen is the totality of it. The book is extensively and well-noted but would benefit from a bibliography and index. 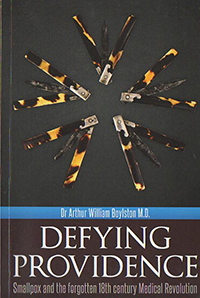 Defying Providence by Dr Arthur Boylston MD (282 pp incl footnotes) is available from Amazon for around £8.50.